Why hesitate ? Choose your alpaca hat to be warm ! Pujpu wool : 70% Baby alpaca - 7% Mérinos - 23% PolyamideA splendid hat combining the luxury of a very soft and warm wool and an elagant design made of braids.Choose to wear a very chic hat this winter ! New ! A mix of 2 luxury yarns : baby alpac and silk ! An unusual and beautiful stitch for this hat made in silky and fine yarns of alpaca and silk. A very soft and nice to wear hat ! 100% Baby Alpaca Different but stylish ! A great design for this beautiful hood. A small jersey stitch and elegant ribs on the collar. Chic and warm it is a great alternative to the classic hat. 100% Baby Alpaca hand knitted and crochet A beautiful hat entirely hand knitted .LA moss stitch in the lower part and a crochet part at the top. Its loose style is cosy and trendy. . 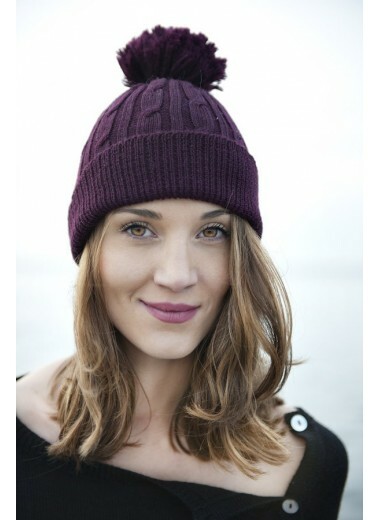 It adapts easily to all faces and makes you look beautiful; Iris, an alpaca hat that stands out from the crowd. 100% Baby AlpacaWith its cable stitch and baby alpaca pompom it is stylish. Long enough it and can be worn close to the head or in a more loose style.Really soft and warm, it will be your ally for winter.